Would a loving Jesus really teach about hell? Yes, and so does every New Testament author. Let’s consider what they teach. In the Sermon on the Mount, often known for its emphasis on love and the kingdom, Jesus teaches the reality and nature of hell (5:20–30; 7:13–27). In Matthew 5:20–30, Jesus contrasts hell with the kingdom of heaven and warns that hell is a real danger to unrepentant sinners. The fire of hell, the justice of hell, and the extreme suffering in hell are particularly stressed. The unrepentant are warned to use extreme measures to avoid being cast into it by God. As Jesus concludes the Sermon on the Mount, He contrasts the kingdom of heaven with the horrors of hell (7:13– 27). Jesus cautions that hell is a place of destruction, depicted as the end of a broad road. Hell awaits everyone who does not enter the kingdom of heaven— even those who profess to know Christ but continue in sin. Jesus is Judge and King who personally excludes the wicked from His presence and the kingdom of heaven (“Depart from me,” 7:23). Indeed, those who fail to follow Jesus are like a house built on the sand that ultimately comes crashing down. Matthew also recounts Jesus’ surprising warning that Jews devoid of faith are in danger of hell, which is portrayed as outside, darkness, and a place of intense suffering (8:10–12). Jesus addresses hell when He commissions His disciples not to fear humans but God alone, “who can destroy both soul and body in hell” (10:28). In Jesus’ parables of the weeds (13:36–43) and the net (vv. 47–50), hell is seen as exclusion/ separation from the kingdom of God, described in terms of fire and is a place of suffering. Jesus later describes hell as a place of “eternal fire” (18:8) and even warns the scribes and Pharisees of hell, characterizing it as inescapable for the unrepentant (23:33). In the Olivet Discourse, Jesus speaks of future punishment in the parables of the slaves (24:45–51), bridesmaids (25:1– 13), talents (25:14–30), and the section on the sheep and goats (25:31–46). Several truths about hell emerge. Hell is punishment for disobedience to the master. Hell is graphically expressed as a location where people are cut into pieces and placed with the hypocrites (24:51) and as a place of suffering (24:51; 25:30). Jesus also likens hell to being outside, or a place of exclusion/separation (25:10–12, 30), as the outer darkness (v. 30), as personal banishment from His presence and the kingdom (“Depart from me,” v. 41), and as just condemnation/punishment (vv. 41, 46). Hell is then described as eternal. It is a place of “eternal fire prepared for the devil and his angels” (v. 41) and of “eternal punishment” (v. 46). Mark 9:42–48 is similar to Matthew 18:6–9 and records Jesus’ teaching that hell is a punishment for sin that is worse than death and earthly suffering. Hell is exclusion from the kingdom of God, a result of God’s active judgment on sin, and a place of eternal suffering. In Luke 13:1–5, Jesus speaks of hell as punishment for the unrepentant, and those in hell are portrayed as perishing. In Luke 16:19–31, Jesus calls for generosity to the poor by proclaiming that justice will prevail through the coming judgment on the wicked oppressors. The punishment is marked by suffering, torment, fire, agony, exclusion from heaven, and finality. It would take too much space to survey all that Paul writes, so we will highlight Romans and 2 Thessalonians. In his letter to the Roman church, Paul stresses that Jews and Gentiles alike are under sin, under God’s wrath, and under God’s judgment. Only those who have faith in Christ will escape. In this context, Paul relates important truths about hell. First, future punishment is connected to God’s wrath. The wicked are presently under His wrath (1:18–32), are objects of wrath (9:22), continually store up wrath for the day of wrath (2:5–8; 3:5), and can be saved from wrath only by faith in Christ (5:9–21). Second, future punishment is God’s judgment. The wicked are deservedly condemned under the judgment of God, which is impartial, true, righteous, and certain (2:1–12; 3:7–8). This condemnation is the result of sin and is just punishment for sin (6:23). Third, future punishment will consist of trouble and distress. This suffering shows no favoritism between Jews and Gentiles (2:8–11). Fourth, future punishment consists of “death” and “destruction.” Sinners deserve death (1:32), the wages of sin is death (6:16–23), as sinners we bear fruit for death (7:5), those who live according to the flesh should expect death (8:13), and sinners are vessels of wrath “prepared for destruction” (9:22). Fifth, both sin and future punishment are separation from Christ (“accursed and cut off from Christ”; see 9:3). As he encourages believers suffering persecution in 2 Thessalonians, Paul stresses that God’s justice will prevail (1:5–10). In just a few verses, Paul emphasizes several important truths about hell: hell is the result of God’s retributive justice on sinners; hell is punishment for those who do not know God and do not obey the gospel; hell is eternal destruction; and hell is exclusion from Jesus’ presence and majesty. Two passages in Hebrews speak clearly about future judgment. Hebrews 6:1–3 refers to the future punishment of the wicked as “eternal judgment” (6:2), which is an “elementary doctrine” of the faith. Hebrews 10:27–30 depicts this judgment as fearful and dreadful and as a raging fire that will consume the enemies of God. It also teaches that hell comes from God as punishment, judgment, and retribution. The letter of James depicts future punishment primarily in terms of destruction, death, justice, and suffering. In particular, the oppressors wither away and are destroyed (1:11); sin produces death as its offspring (1:15; see 5:20); and God is the Lawgiver and Judge, able to save and destroy (4:12). James teaches that oppressors of God’s people deserve to be punished severely. This just suffering is certain and severe, graphically portrayed as miseries, flesh being consumed by fire, and the day of slaughter. Peter’s second letter is filled with references to hell, and Jude closely parallels 2 Peter 2. Peter and Jude both depict hell as destruction (2 Peter 2:1, 3, 12; Jude 5, 10, 11), as condemnation hanging over the wicked (2 Peter 2:3; Jude 4), and as a gloomy dungeon where rebellious angels are held for judgment (2 Peter 2:4; Jude 6 is similar). Peter illustrates future punishment with the account of Sodom and Gomorrah burning to ashes (2 Peter 2:6) and warns that God holds the unrighteous for the Day of Judgment while continuing their punishment (2:9). Peter also writes that hell is a place of retribution (v. 13) and blackest darkness (v. 17; Jude 13). Jude adds that hell is a punishment of eternal fire (Jude 7, 15, 23). Revelation teaches that hell is a place where God’s fury and wrath are felt at full force (14:10). Hell is a place of intense suffering, filled with “fire and sulfur” (14:10; see the lake of fire in 20:10, 14–15; 21:8), a place where “the smoke of their torment goes up forever and ever” (14:11). The suffering is continual: “They have no rest, day or night” (14:11), and “they will be tormented day and night forever and ever” (20:10). In Revelation 20:10–15, the Apostle John emphasizes that hell is just punishment for the wicked. God casts the devil, the Beast, and the False Prophet into hell. They do not rule or have any power in hell but are “thrown” there (20:10). Hell will also contain everyone whose name is not found in the book of life (v. 15). Such will be separated from God in hell (21:6–8) and banished from heaven (22:15). 1. Punishment. The chief picture of hell is a place of punishment for sin. The punishment is deserved, consists of suffering, and is eternal. 2. Destruction. 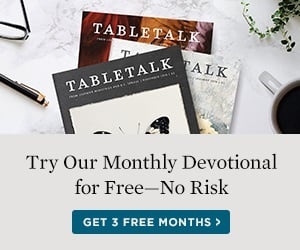 This destruction is likened to death, second death, loss, and ruin (see Robert Peterson’s article in this issue of Tabletalk for more on this). 3. Banishment. Whereas punishment stresses the active side of hell, banishment shows the horror of hell by highlighting what unbelievers miss—the very reason for their existence, namely, to glorify and love God. Hell—this is what we deserve. This is how sinful we are. This is what Christ endured for our sakes. And this should spur us to share the gospel. Dr. Christopher W. Morgan is dean and professor of theology of the School of Christian Ministries at California Baptist University in Riverside, Calif. He is coeditor of Hell under Fire: Modern Scholarship Reinvents Eternal Punishment.